Our last day was at sea. I really do enjoy sea days and like to have the last day on the ship be at sea so that I can just relax. I started out this day by going to a Culinary presentation in the main theater and then a galley tour. It was really interesting. Of course, I didn’t take notes, but besides demonstrating how to make a simple pasta dish and a Caesar salad with dressing, they also told us how many eggs, bread rolls and some other staggering statistics from the kitchen. The galley we toured serves both of the main dining rooms. After this I headed out to the pool with my niece, her son and boyfriend. We had some cocktails and got some sun. They had a lot of fun stuff going on right next to us including a cocktail making competition and ice sculpting demonstration. I won a free cocktail – yay!! At some point we went up and played miniature golf – it’s a pretty lame course, but a way to kill some time. We also found the “video arcade” with 4 ancient games in it that evidently eat your money. This day was pretty much like our other at sea day. 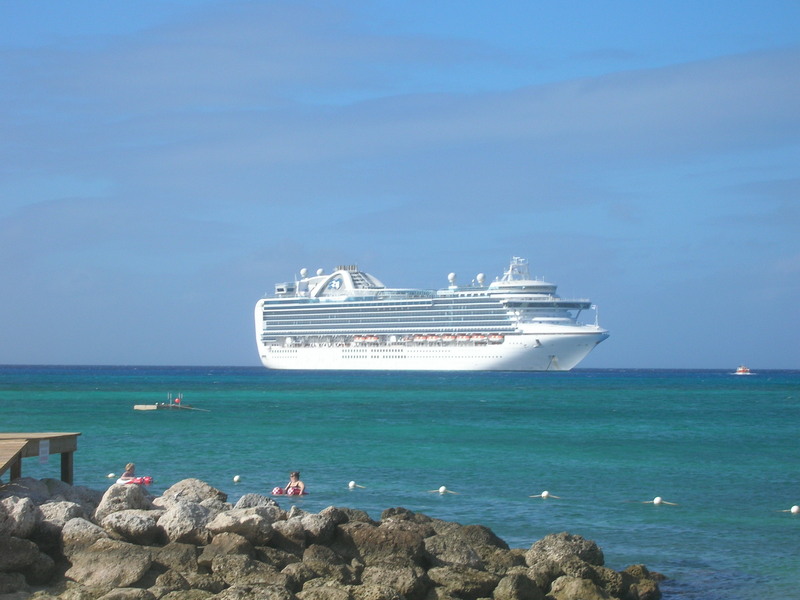 I’m going to finish this post with my overall review of the Ruby Princess. I hadn’t cruised in about 4 years and this was my first time with Princess, and I have to say I was a little disappointed. Since I’ve come back I’ve done some research and it seems that I am not alone – the overall cruise experience on the “mass market” cruise lines seems to have gone down in the last few years. The Ruby Princess is a beautiful ship with a lot of great things. I loved the International Café; Vines Wine Bar could have been more enclosed to make it feel more special, but the service was good; the Crown Grill was incredible; Princess Cayes was a nice alternative to having a 3rd sea day; the entertainment was good; the internet café had plenty of computer and the speed was much better than in the past; the Trident Grill made good burgers; the adults only Terrace Pool was a plus as well. On the down side, I found the food in the main dining room to be uninspired – the preparation was good, but the choices were not very interesting; the overall service on the ship was lacking – although my room steward, Henry, was very friendly and did a good job; the Casino had a sign up one morning that it would be smoke free that evening, but when I went in people were smoking; I didn’t like the big screen over the Calypso Pool with movies & concerts playing all day – it was too noisy for me and this was where the comfy lounge chairs were – although I thought Movies Under the Stars at night was a great idea. I just did not feel the WOW factor that I’ve had in my previous 5 cruises. I will definitely not set my expectations so high the next time I go cruising. That’s it for the cruise. We were back inFort Lauderdalethe next day. We stayed over one night at theCrownePlazanear the port/airport. It was really nice and comfortable and in a very convenient location. I would recommend this hotel. We rented a car and drove down to Miami to check out South Beach. Had a little lunch and walked on the beach. It was very windy and a little overcast, but still warm. This was a nice relaxing end to our week. 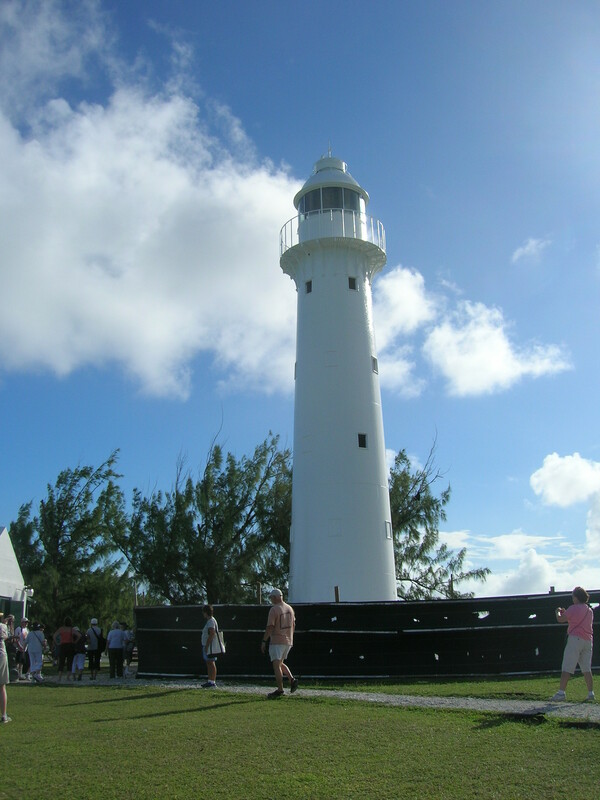 I was excited to visit Grand Turk because I had not been to the Turks & Caicos before. I’ve read about it and knew that the water was beautiful. We rented a golf cart to explore the island on our own. We just had to walk out of the cruise terminal and there was Nathan’s golf carts (and jeeps). We got a quick lesson in how to drive it and we were off. There was a man on a bicycle following us – I thought he was going to overtake us for awhile, but then we started up a slight incline and pulled away. Whoo, that would have been embarassing. We passed the airport. Our hope was that we would find a great beach where we could do some swimming and hopefully see some fun fish. 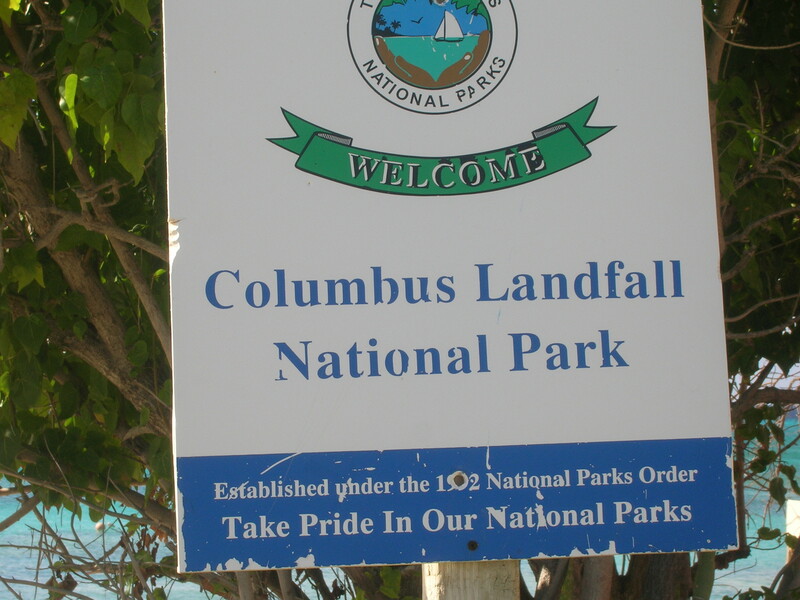 We came to Landfall Beach and stopped and looked around. There were some great shells and the view was nice, but we couldn’t swim because it was very rocky (big rocks) and it looked like it got deep pretty quickly. When we got ready to leave, we had trouble getting the golf cart started. It seemed to be flooded. The good thing was, it was so light weight we could just push it into the shade and relax while we waited for it to recover. Soon we were on the way again. We had a lot of fun riding around. 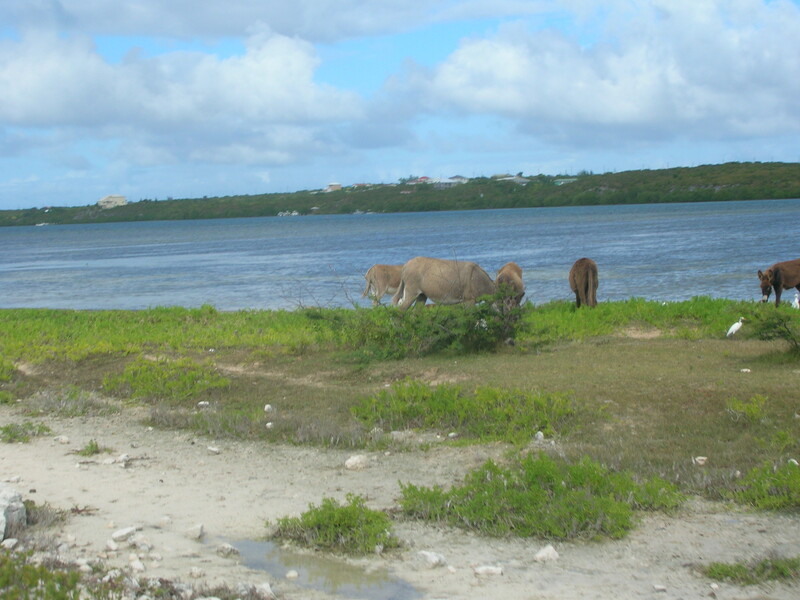 There were a lot of burros grazing around the island. We saw a group of about 8 – 10 horses just walking down the street. Lot’s of dogs – most of them looked pretty healthy, but there were a couple that were so thin they just broke my heart. We went to the lighthouse – what a view from this spot. We drove through some neighborhoods and got chased by a couple of dogs – my niece and I were worried about losing a couple of toes. Floor this cart, get us out of here! There were some really nice houses on Grand Turk, and some that were not so nice. The island itself is very flat and dry – I wouldn’t go out of my way to go back. After touring the island for a couple of hours, we headed back and dropped off the golf cart. 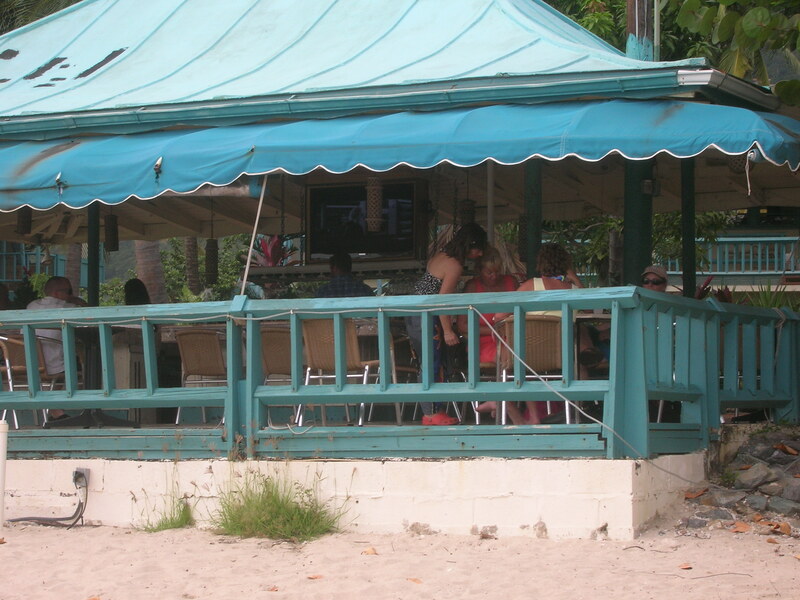 Then we headed to Jack’s Shack for our free shot of rum and a late lunch. Everyone in our group was pretty tired and not into the party atmosphere here, so after lunch we headed back towards the ship. As we were heading back the sun was starting to go down – I was a little disappointed because there had been a couple of souvenir stalls on the beach that had closed up. I stopped and did a little shopping at the pier – I still needed a couple of things to bring home, like rum cake and cooking sauces (that reminds me, I still have a rum cake – need to take a quick break). By the time I finished it had started pouring rain. Oh, well, it’s warm rain. 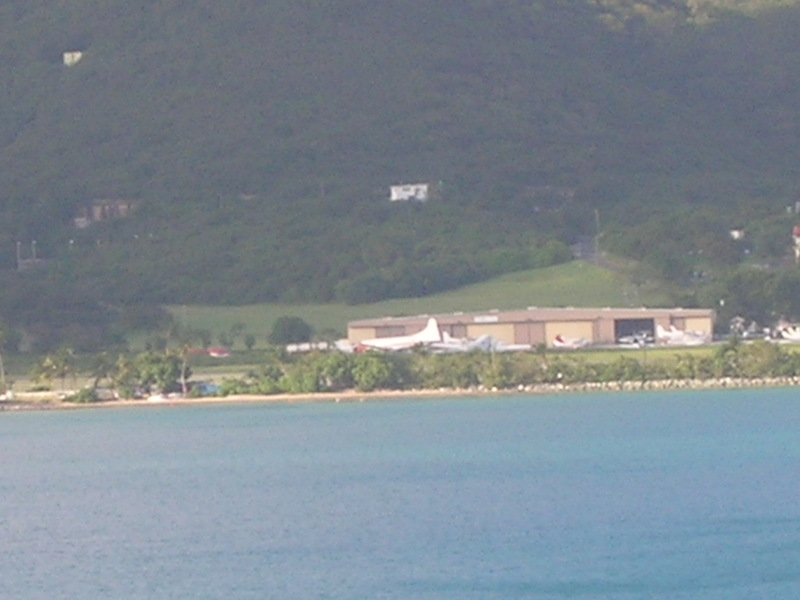 A lot of people just stay on the beach near the cruise ships – there is a big Margaritaville with lots of beach chairs. 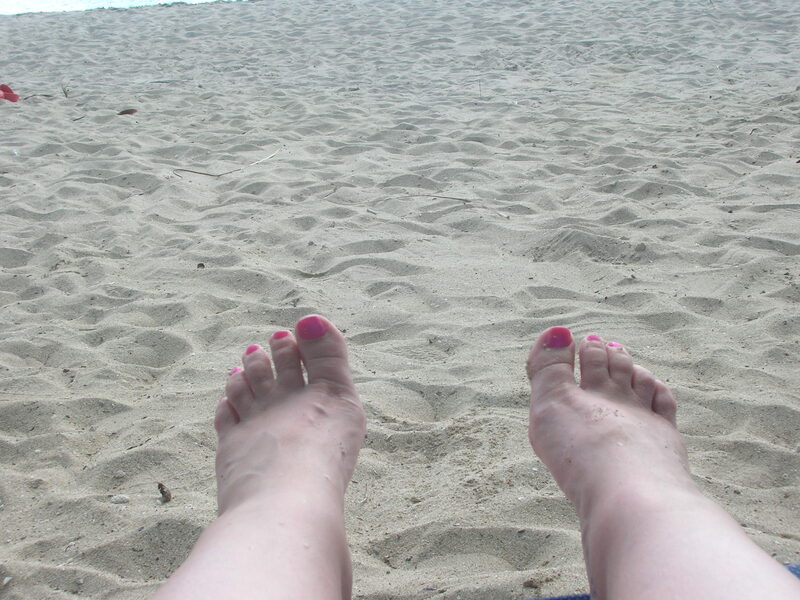 If I was on a cruise that stopped in Grand Turk again, I would probably just spend the day at the beach – probably Jack’s. I’ve posted more pictures on my Facebook page if you’d like to see more scenery. 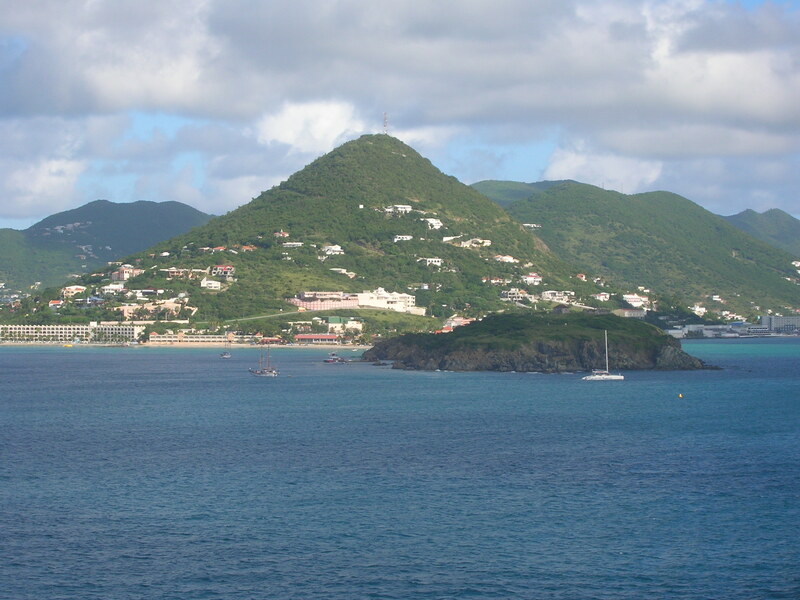 I’ve been to St. Thomas several times before, but I do love it so was excited to go back again. This time the plan was pretty much the same as in the past – a little shopping, then head to the beach. I woke up not feeling great – a little too much rich food, I think – so I decided to skip the shopping and just meet up at Lindbergh Beach. It was nice to sleep in a little, have a light and leisurely breakfast, and get off the ship after most people had already gone. It was a little strange when I was walking out of the port area (which always has some shops and such for those who don’t want to venture too far) to see all the Christmas trees and decorations. It just didn’t feel like Christmas was approaching with the sunshine and 80 degree weather. I had a little trouble getting a taxi because I was alone and the trip to the beach was only $4 per person. In the islands it often costs so much a person and the drivers weren’t going to make anything off of me. Finally one driver said he would take me – and he had a full size van. It’s a quick trip and most people were already off the ship so he was good with it. By the time I got there the family was already there. Dennis (or Jacques as I’d started calling him) was out swimming with his goggles on looking for fish. Danielle was at the bar ordering Red Stripes – thank goodness she saw me in time to add one to her order. I pulled a chair up next to theirs, paid my $6 to the gentleman who was in charge, drank a little beer, then headed into the water. When we found this beach 5 years ago, it was pretty unknown and deserted. 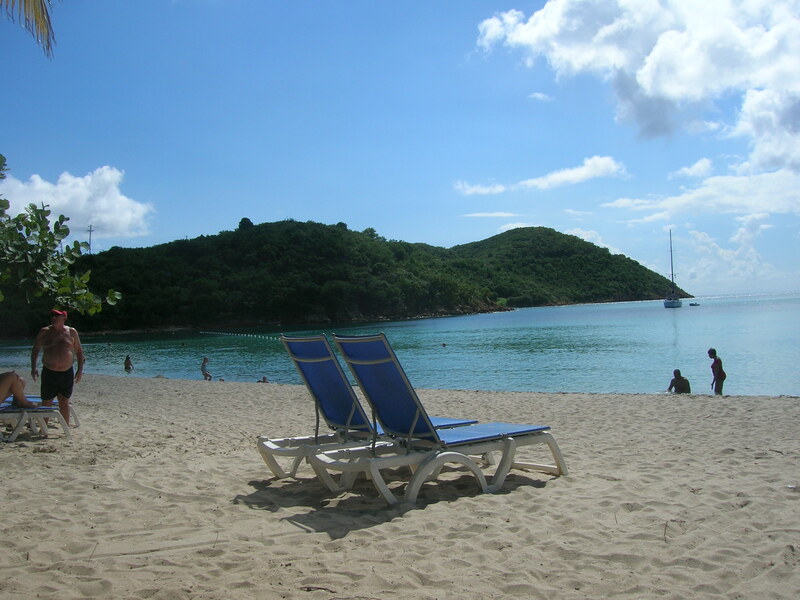 More people have found it, but it’s still much less crowded than some of the more popular beaches on the island. Last time there were 2 vendors, this time none. The area we sit on is in front of the Island Beachcomber hotel. There is a great little bar there for drinks and lunch. Right behind the beach is the airport, but there are not a lot of flights so the noise is not a problem. This hotel is adjacent to the Best Western Emerald Bayand the beach on that side is a little more crowded. I would definitely consider staying at the Emerald Bay in the future. I have had clients stay here and after seeing the beach the first time I understood why they enjoyed it so much. One of the great things is that this is a nice little cove which is great for swimming. You can go quite a ways out and still touch bottom – it’s all nice and sandy with no drop offs. We spent several nice hours here drinking beer, swimming, sunning and having a little lunch. The only fish we really saw were close to shore – there were a bunch of silver fish about 4 – 6 inches long, when one would come up to you suddenly there would be a bunch of them. Kind of freaky. 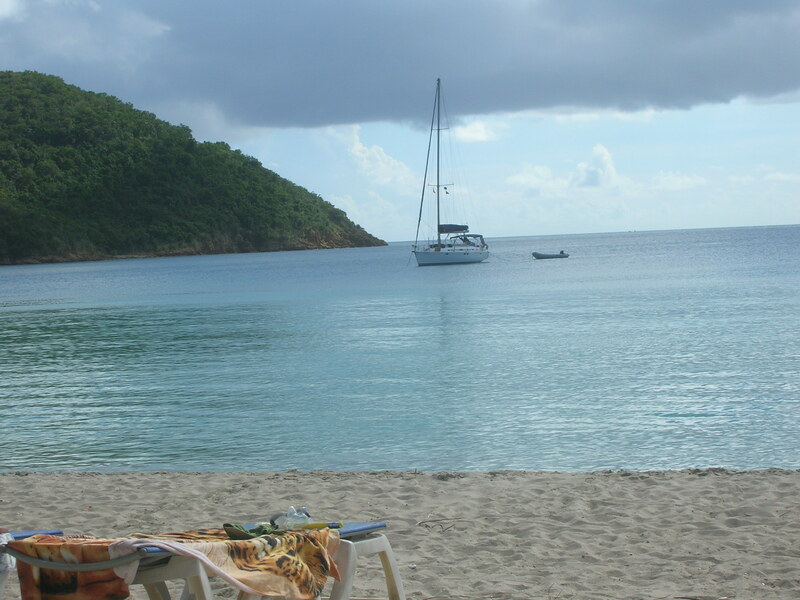 There were a couple of sailboats moored in the cove – I seriously considered swimming out and stowing away on one so I wouldn’t have to come home. The taxi drivers on these islands are great. They know when the ships leave and they start coming around to the beaches an hour or so before you really have to leave to make sure that everyone gets back. I guess they know that we are going to lose track of time. 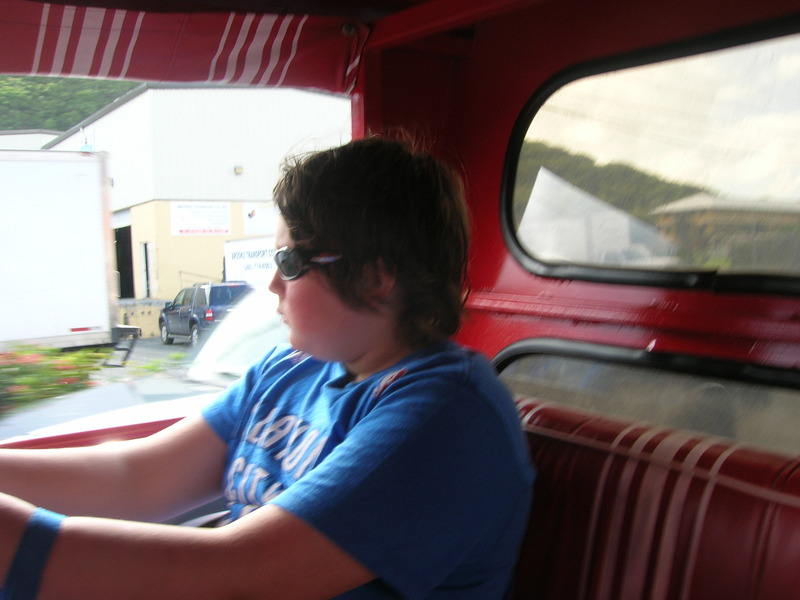 We rode back in one of the open air jitneys – this is my nephew wearing the cool sunglasses he bought in town that morning. Although we had a fabulous day at the beach, we were looking forward to that night because we had reservations at the Crown Grill. 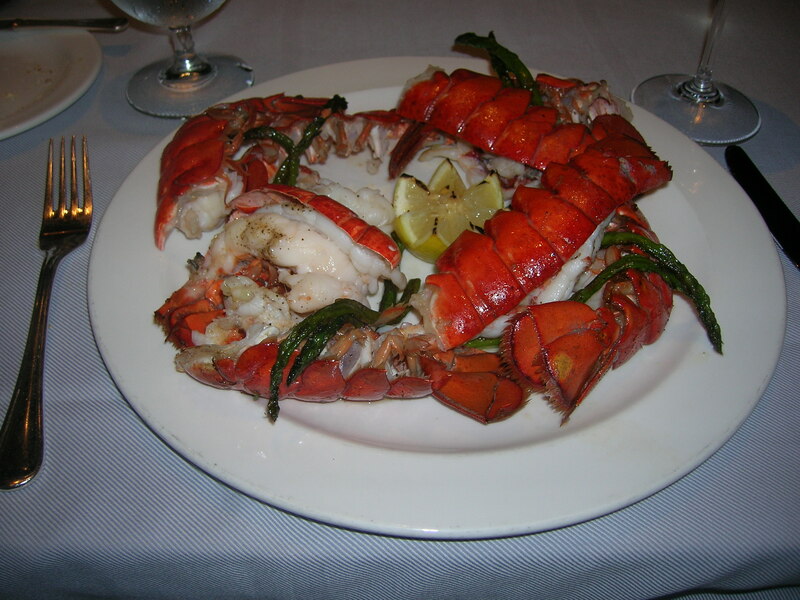 I’ve always been one of those people who couldn’t understand why, when there is so much fabulous food included with the price of the cruise, anyone would want to spend $20 – $30 to eat in the specialty restaurants. I decided that as a travel consultant I should try it so that I could advise my clients as to whether it was really worth it. We started with the appetizer – most of us had scallops and foie gras. I’d never had foie gras before, and frankly didn’t like it so passed it off to Dennis. The scallops were fabulous though! I had the goat cheese salad which was really tasty. For the main course my nephew ordered a 22 ounce Porterhouse, my niece and I ordered the Maine Lobster Tails (we didn’t notice the plural and thought we were getting one 4 ounce tail). This is what we got! Amazing. And we still had dessert to come. We were at the restaurant for 2 ½ hours. The service was wonderful – we really enjoyed this experience. I am a believer now! This was a fabulous dining experience. For $25 per person ($12.50 for my 12 year old nephew), you can’t beat it. I will always recommend that my clients try the specialty restaurant at least one night during their cruises from now on. 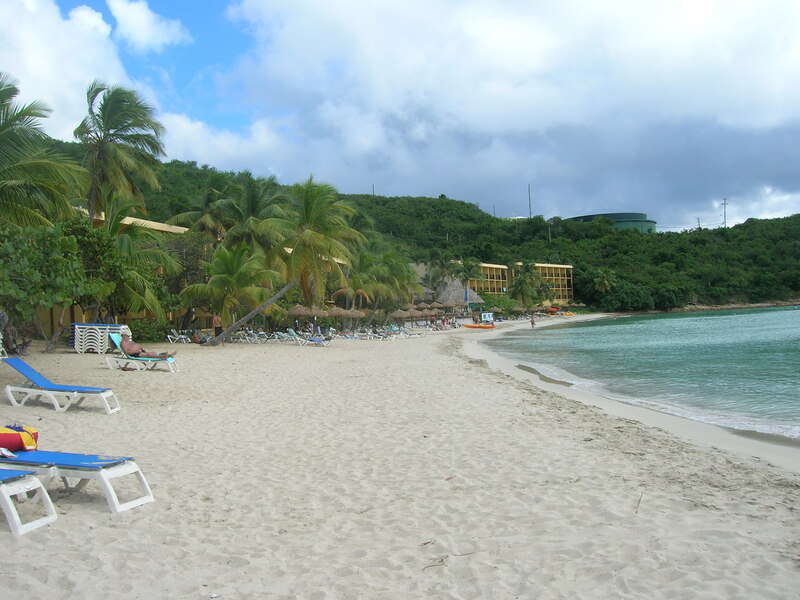 I think I’m going to need to spend a week on St. Thomas so that I can see some other beaches, take the ferry over to St. John and see what else it has to offer. 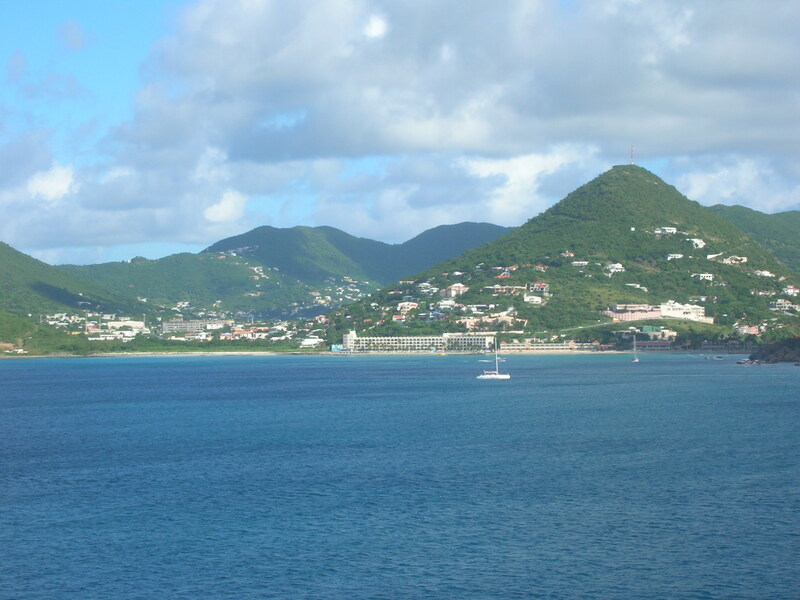 I went up on deck, with my camera this time, as we sailed into St. Martin/ St. Maarten. I had forgotten how hilly and beautiful this island is. 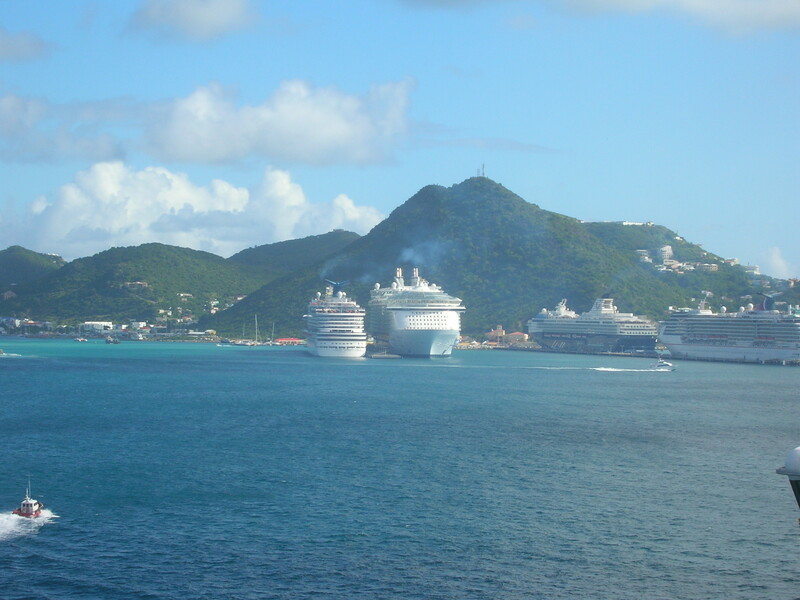 As we came closer to the pier, I could see the other ships in port, including Royal Caribbean’s Oasis of the Seas. It was next to one of the Carnival ships and it is HUGE! I tried to get a shot from the side, but could not fit it into on frame. We had decided to go to Orient Beach because Pam wanted to do some parasailing. I remembered Orient Beach from my first trip toSt. Martin years ago. When you exit the port area, there are waiting areas for the various destinations you might want to visit while on island. You just find the appropriate sign, get in line, and soon you are in a taxi or little bus and on your way. Very well organized. 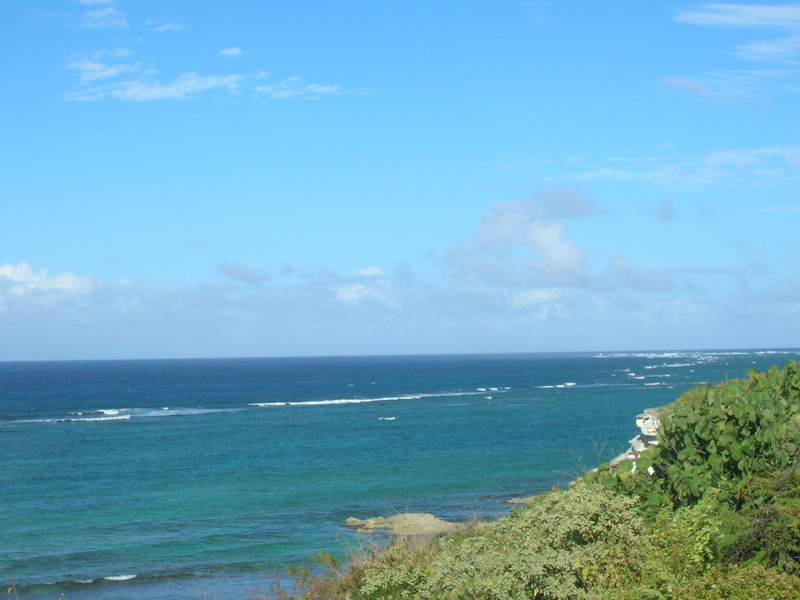 The drive was about 30 minutes through the countryside and neighborhoods of St. Martin. I always enjoy seeing the local houses and businesses along the way. The taxi dropped us by Bikini Beach and we headed off to get some chairs and umbrellas – $18 for 2 chairs with an umbrella which I think is pretty reasonable. Pam was anxious to get to parasailing, but I wanted a beer or 2 first. I got a bucket of beer, and by the time I had half Pam had convinced me to just go check it out. We went over to the closest Parasailing place and were told they only had room for 2 more that day so if we could pay now we’d be next out to the boat. We understood that to mean that they were booked up for the day, and if we wanted to go we had better go now. So we went back for our money and got the life jackets on and were told that we would be taken to the boat by jet ski. Alright! Parasailing and a jet ski ride with a hunky guy for $50 – seems like a deal to me. It was really windy this day and the waves were pretty big. Pam got motioned out for the first jet ski and she managed to get up on it and one big wave hit her, she rode that one out, when the next wave came in the ski had turned sideways and over she went. Oh, boy, it’s funny when it happens to someone else, but I’m going to be next. Finally both she and the driver were onboard and headed out to the boat. Another guy motioned me out and he got me on the back, gave it a little gas while he pulled himself up, which seemed to work a little better. It was a pretty bumpy ride out to the boat, but having owned my own jet ski years ago, I always enjoy the ride. When I got to the boat I realized that there were about 3 parties ahead of us still to parasail. Ok, so we get a little boat tour along with our jet ski ride and parasailing excursion. It turned out to be fun though because everyone on the boat was happy and fun, and we got to watch several people before our turn which made me a little more comfortable. Unfortunately, our friends who were taking pictures from shore had no way of knowing when it was our turn so the pictures are of random people parasailing. Pam went first, I felt it was a good sign that she was still smiling when she came back onboard. Finally it was my turn. I’d been told by a friend years ago that parasailing is fun going up and coming down, but kind of boring when you’re up there. That is pretty accurate. It an interesting sensation going off of the boat – a little scary. When you get up in the air, it’s interesting to look around at the surrounding islands and you can see a lot. I felt sort of suspended in the air – like I wasn’t moving, but I could see the boat moving below. Then they are reeling you in. This is a little nerve racking because you can hear the harness creaking, it makes you think about what you’ve been hanging from for the last 10 minutes or so. The 2 guys running this operation liked to give us a little dip into the water before bringing us all the way in. There was a father with his teenage daughter who went a couple of people before us who lifted their feet and ended up going almost under the water. This seemed to encourage our guys to dip us all a little more than they had been doing. I definitely got wet – but it was fun and very refreshing. Finally I was back on the boat and before long back on the jet ski heading back to shore. My driver this time was a little better at threading his way through the waves so it wasn’t quite so bumpy most of the way in, but when we turned towards shore it got pretty rough again. Getting off that jet ski was a challenge and I even hit the edge a bit with by behind as I got into the water. I’m glad I finally parasailed, but don’t think it is something I need to do again. We spent the rest of the afternoon playing in the water, drinking beer and relaxing. There were quite a few vendors on the beach. I did buy a blouse that I could use as a bathing suit cover up, but I have plenty of tote bags and island jewelry from previous trips. There was a water trampoline a ways out. Pam and I swam out to it. My niece and great nephew soon joined us and she commented that she hoped no one came out to collect their $5 (or was it $10?). What? On the side of the trampoline in big letters there was a $ sign with either 5 or 10 after it so apparently at some time someone was charging for you to use this. We hung out there for awhile, but it got a bit hot, and I basically rolled off back into the water and headed back to shore. 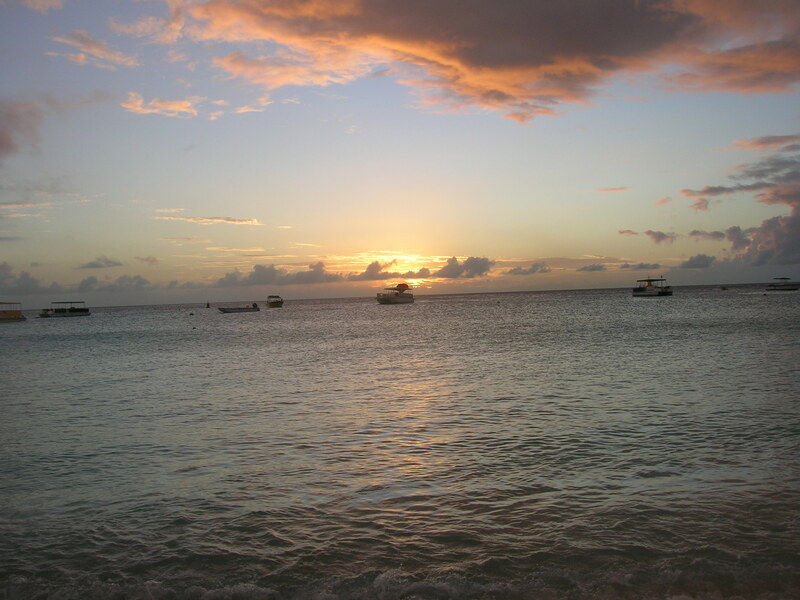 That was a pretty good swim with that rough water, but I LOVE the Caribbean water. 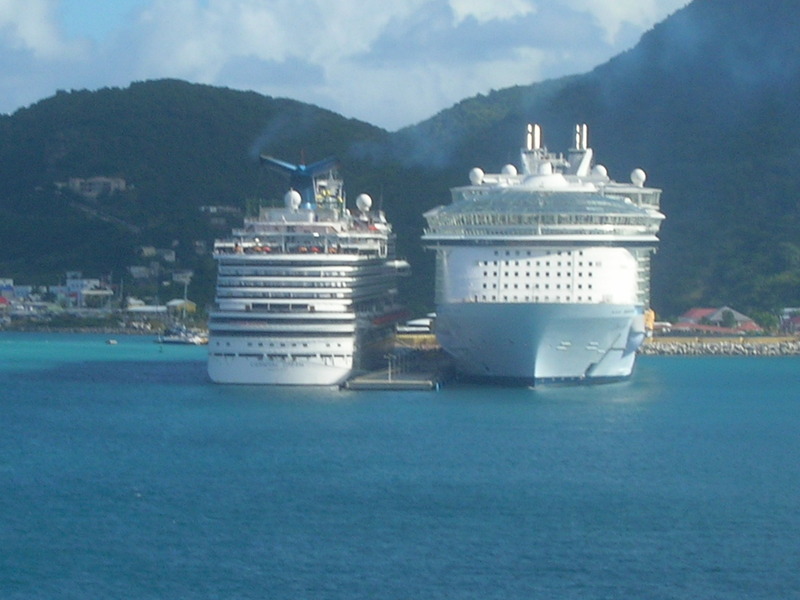 This was a great day – just what I want when I’m cruising theCaribbean. Eventually we decided we should head back to the ship. No problem getting a taxi (in fact, we had 2 drivers almost come to blows over us). We did not do any shopping, although the driver did stop so people could get off and go intoPhillipsburgand shop. We opted to go back to the ship, rinse the sand off, and enjoy the ships amenities. Not only did I not take pictures, I also didn’t keep a journal of my trip like I usually do, so I can’t remember everything I did. During our first day at sea, I spent some time on deck reading. I took a nap. I had some cocktails. I ate in the buffet. I explored the ship. I went to Vine’s Wine Bar before dinner. The Ruby Princess has a lot of amenities and there is something to do all the time. If you want to eat you have the choice of the buffet; the International Café which has salads, sandwiches, desserts, cheese trays, and gelato; the pizza and ice cream bar; Trident Grill for very good burgers and hot dogs; and more. As for cocktails, there are numerous bars including Vines, Crooners Martini Bar, Wheelhouse Bar; Explorers Lounge, Club Fusion and of course Skywalkers nightclub; you can try your luck at Gatsby’s Casino; Movies Under the Stars – they actually show movies and concert footage most of the day so you can enjoy entertainment by the Calypso Pool; music by the Neptune Pool; you might prefer an adults only atmosphere at the Terrace Pool or the Sanctuary; there is entertainment in the Atrium area – jugglers and musical entertainment; maybe get a Spa Treatment – I didn’t, but Pam & Rosanna did and said it was fabulous; a not great mini golf course, but a way to spend some family time; and much more. This was the first of 2 formal nights during the cruise, so I did dress up and met up with my niece and her family for pictures before dinner. They actually came out pretty good and we all bought one. My scanner is not working or I’d post it. I decided to go to the show after dinner. No one else was up for it, but I got there about 20 minutes early. I always look forward to their big musical productions – I can’t remember the name but it was kind of a Broadway tribute with lots of singing and dancing. The boat was rocking pretty good again. The good thing about the rocking was it made me sleepy which was great at night. The bad thing is it made me sleepy so I was having trouble staying awake anytime I sat still for very long. I was seriously having trouble staying awake until the show started. It was a really good show and I’m always amazed that the dancers can manage to dance in heels and do lifts and all on that rocking ship. Unfortunately, I only made it through about a half hour before I had to head to my room and bed. I love sea days because it is so relaxing if that’s what you want, or you can be busy all day if you want. Personally, I like a good, lazy day at sea. One of the things I enjoy most about cruising is that it’s so easy to just head out to eat whenever you are ready and I don’t have to wait for my travel companions or try to decide where to go. This morning I decided to just order room service and got a breakfast sandwich, banana, juice and milk. No charge except for a tip to the delivery person. I love that! I met up with my group to get off the ship and take the tender ashore. Pam had gotten a clamshell (little cover with 2 chairs) and we were renting aqua chairs and snorkel equipment. When you get onto Princess Cayes (their private beach area on theislandofEleutherain theBahamas) you head left for the free, unreserved chairs or right for the clamshells and beach bungalows. We headed to the right and dropped our stuff at the clamshell and Dennis and I snorkeled up and headed into the water. The others got a cocktail and headed out in their aqua chairs. I was somewhat surprised at how many fish we saw in the roped off swimming area. There were not a lot of swimmers on this side so the water was pretty clear. We saw some fairly big blue fish with yellow stripes on the side, some flat blue fish that looked like the kind you see in aquariums (one turned on it’s side and waved at me), some yellow & black fish, plus more. I also enjoyed looking at the plant life on the bottom of the sea. This is really a great place for a beach day. They have some shops so you can do some souviner shopping; a couple of bars so you can get drinks – as well as waiters on the beach which I loved; you can go just outside of the Princess property for some more shopping (we didn’t do this because everything we needed was inside); they serve lunch (no charge – just like on the ship) on both sides – hotdogs & hamburgers, with salads and desserts on our side and a BBQ on the other side; watersports rentals; even a few excursions. You can go back and forth to the ship if you need to. I think the last tender back was around 3:15. Here is the one picture I took this day – our ship from shore. This day was Pam’s actual birthday so we went out and partied. We stayed very late in the disco. 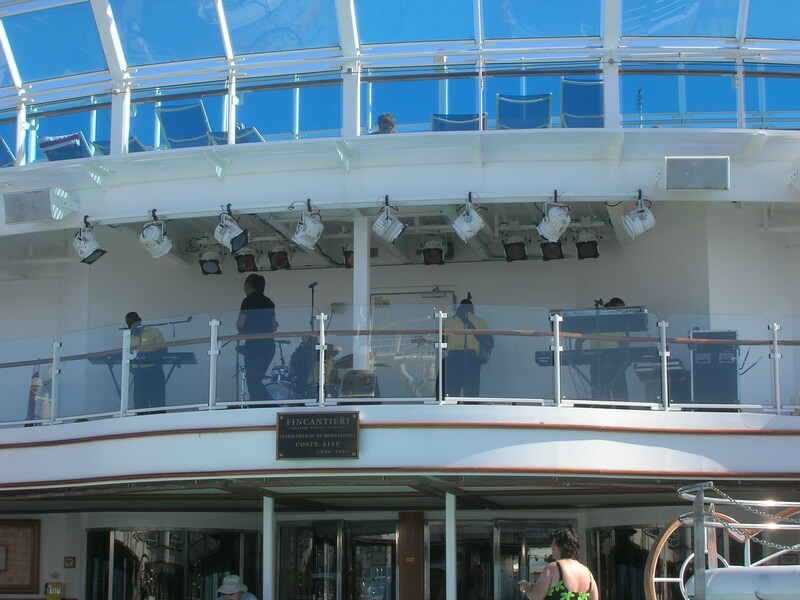 There was a lot of ship movement on this cruise so the dance floor was pretty interesting. As time went on people seemed to adjust and when the ship rocked, we all went with it. As a group we’d dance from one side of the floor to the other – almost like a line dance. A good time was had by all.